A World Heritage Site is a place (such as a building, city, complex, desert, forest, island, lake, monument, or mountain) that is listed by the United Nations Educational, Scientific and Cultural Organization (UNESCO) as being of special cultural or physical significance. The list is maintained by the international World Heritage Programme administered by the UNESCO World Heritage Committee, composed of 21 UNESCO member states which are elected by the General Assembly. The programme catalogues, names, and conserves sites of outstanding cultural or natural importance to the common heritage of humanity. Under certain conditions, listed sites can obtain funds from the World Heritage Fund. The program was founded with the Convention Concerning the Protection of the World’s Cultural and Natural Heritage, which was adopted by the General Conference of UNESCO on 16 November 1972. Since then, 191 states parties have ratified the Convention, making it one of the most adhered to international instruments. Only Liechtenstein, Nauru, Somalia, South Sudan, Timor-Leste, and Tuvalu are not Parties to the Convention. As of July 2015, 1031 sites are listed: 802 cultural, 197 natural, and 32 mixed properties, in 163 states parties. According to the sites ranked by country, Italy is home to the greatest number of World Heritage Sites with 51 sites, followed by China (48), Spain (44), France (41), Germany (40), Mexico (33), and India (32). UNESCO references each World Heritage Site with an identification number; however, new inscriptions often include previous sites now listed as part of larger descriptions. Consequently, the identification numbers exceed 1,200, even though there are fewer on the list. Territorial division. The following overview lists only countries with ten or more World Heritage Sites. While each World Heritage Site remains part of the legal territory of the state wherein the site is located, UNESCO considers it in the interest of the international community to preserve each site. Preface: This is a list of UNESCO World Heritage Sites in China. 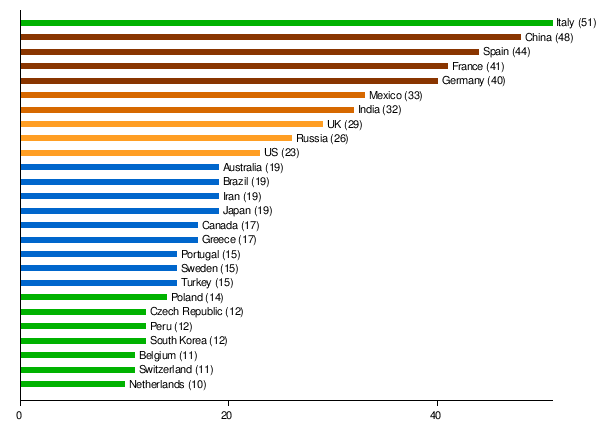 China has 48, ranking second in the world. China ratified The Convention Concerning the Protection of the World Cultural and Natural Heritage on 12 December 1985. These sites comprise some of the most essential part of China’s valuable and rich tourism resources. Since joining the International Convention Concerning the Protection of World Cultural and Natural Heritage in 1985, China has 48 world heritage sites to date; of these 34 are cultural heritage sites, ten are natural heritage sites, and four are cultural and natural (mixed) sites, ranking second in the world. Since 2004, China has made the first large-scale renovations on seven world cultural heritage sites in Beijing – the Ming Tombs, the Great Wall, the Forbidden City, the Temple of Heaven, the Summer Palace, the Grand Canal, and the “Peking Man” site at Zhoukoudian, all of which are planned for completion before 2008. In addition, China has rich intangible cultural heritages (ICHs), with several of them inscribed on UNESCO’s list of Masterpieces of the Oral and Intangible Heritage of Humanity. 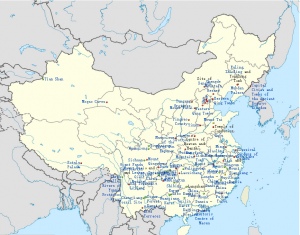 Following is a map of the World Heritage Sites in China. Numbered sites in Beijing: 1. Great Wall of China; 2. Forbidden City; 3. Zhoukoudian; 4. Summer Palace; 5. Temple of Heaven; 6. Ming Dynasty Tombs. Map of the World Heritage Sites in China (48). Sites are listed chronologically according to their inscription date from oldest (Mount Taishan, 1987) to youngest (Tusi Sites, 2015). The sacred Mount Tai (‘shan’ means ‘mountain’) was the object of an imperial cult for nearly 2,000 years, and the artistic masterpieces found there are in perfect harmony with the natural landscape. It has always been a source of inspiration for Chinese artists and scholars and symbolizes ancient Chinese civilizations and beliefs. As the royal residences of the emperors of the Ming and Qing dynasties from the 15th to 20th century, the Imperial Palaces of the Ming and Qing dynasties in Beijing and Shenyang were the centre of State power in late feudal China. The Imperial Palace of the Ming and Qing Dynasties in Beijing known as the Forbidden City was constructed between 1406 and 1420 by the Ming emperor Zhu Di and witnessed the enthronement of 14 Ming and 10 Qing emperors over the following 505 years. The Imperial Palace of the Qing Dynasty in Shenyang was built between 1625 and 1637 by Nurgaci for the Nuzhen/Manchu forebears of the Qing Dynasty, which established itself in Beijing in 1644. Also known as Houjin Palace or Shenglin Palace, it was then used as the secondary capital and temporary residence for the royal family until 1911. The Imperial Palaces of Beijing and Shenyang were inscribed on the World Heritage List in 1987 and 2004 respectively. The Forbidden City, located in the centre of Beijing is the supreme model in the development of ancient Chinese palaces, providing insight into the social development of late dynastic China, especially the ritual and court culture. The layout and spatial arrangement inherits and embodies the traditional characteristic of urban planning and palace construction in ancient China, featuring a central axis, symmetrical design and layout of outer court at the front and inner court at the rear and the inclusion of additional landscaped courtyards deriving from the Yuan city layout. As the exemplar of ancient architectural hierarchy, construction techniques and architectural art, it influenced official buildings of the subsequent Qing dynasty over a span of 300 years. The religious buildings, particularly a series of royal Buddhist chambers within the Palace, absorbing abundant features of ethnic cultures, are a testimony of the integration and exchange in architecture among the Manchu, Han, Mongolian and Tibetan since the 14th century. Meanwhile, more than a million precious royal collections, articles used by the royal family and a large number of archival materials on ancient engineering techniques, including written records, drawings and models, are evidence of the court culture and law and regulations of the Ming and Qing dynasties. The Imperial Palace of the Qing Dynasty in Shenyang while following the traditions of palace construction in China retains typical features of traditional folk residences of the Manchu people, and has integrated the architectural arts of Han, Manchu and Mongolian ethnic cultures. The buildings were laid out according to the “eight-banner” system, a distinct social organization system in Manchu society, an arrangement which is unique among palace buildings. Within the Qingning Palace the sacrificial places for the emperors testify to the customs of Shamanism practiced by the Manchu people for several hundred years. Located at the northern foot of Lishan Mountain, 35 kilometers northeast of Xi’an, Shaanxi Province, Qinshihuang Mausoleum is the tomb of Emperor Qinshihuang, founder of the first unified empire in Chinese history during the 3rd century BCE. Begun in 246 BCE the grave mound survives to a height of 51.3 meters within a rectangular, double-walled enclosure oriented north-south. Nearly 200 accompanying pits containing thousands of life-size terra cotta soldiers, terra cotta horses and bronze chariots and weapons – a world-renowned discovery – together with burial tombs and architectural remains total over 600 sites within the property area of 56.25 square kilometers. According to the historian Sima Qian (c. 145-95 BCE), workers from every province of the Empire toiled unceasingly until the death of the Emperor in 210 in order to construct a subterranean city within a gigantic mound. The Jiuzhaigou Valley Scenic and Historic Interest Area is a reserve of exceptional natural beauty with spectacular jagged alpine mountains soaring above coniferous forest around a fairyland landscape of crystal clear, strange-coloured blue, green and purplish pools, lakes, waterfalls, limestone terraces, caves and other beautiful features. These include a number of karst formations; indeed the area is a “natural museum” for alpine karst hydrology and research. Covering 72,000 ha in the northern part of Sichuan Province, Jiuzhaigou preserves a series of important forest ecosystems including old-growth forests which provide important habitat for numerous threatened species of plants and animals, including the giant panda and takin. Attaining heights of 4,752 m in the southern Minshan Mountains, Jiuzhaigou also contains an important number of well-preserved quaternary glacial remnants with great scenic value. A spectacular area stretching over more than 26,000 ha in China’s Hunan Province, the site is dominated by more than 3,000 narrow sandstone pillars and peaks, many over 200 m high. Between the peaks lie ravines and gorges with streams, pools and waterfalls, some 40 caves, and two large natural bridges. In addition to the striking beauty of the landscape, the region is also noted for the fact that it is home to a number of endangered plant and animal species. The palaces and temples which form the nucleus of this group of secular and religious buildings exemplify the architectural and artistic achievements of China’s Yuan, Ming and Qing dynasties. Situated in the scenic valleys and on the slopes of the Wudang mountains in Hubei Province, the site, which was built as an organized complex during the Ming dynasty (14th–17th centuries), contains Taoist buildings from as early as the 7th century. It represents the highest standards of Chinese art and architecture over a period of nearly 1,000 years. The Potala Palace, winter palace of the Dalai Lama since the 7th century, symbolizes Tibetan Buddhism and its central role in the traditional administration of Tibet. The complex, comprising the White and Red Palaces with their ancillary buildings, is built on Red Mountain in the centre of Lhasa Valley, at an altitude of 3,700m. Also founded in the 7th century, the Jokhang Temple Monastery is an exceptional Buddhist religious complex. Norbulingka, the Dalai Lama’s former summer palace, constructed in the 18th century, is a masterpiece of Tibetan art. The beauty and originality of the architecture of these three sites, their rich ornamentation and harmonious integration in a striking landscape, add to their historic and religious interest. Norbulingka, the Dalai Lama’s former summer palace constructed in the 18th century, is located on the bank of the Lhasa River about 2km west of the Potala Palace in a lush green environment. It comprises a large garden with four palace complexes and a monastery as well as other halls, and pavilions all integrated into the garden layout to create an exceptional work of art covering 36ha. The property is closely linked with religious and political issues, having been a place for contemplation and for signing political agreements. The temple, cemetery and family mansion of Confucius, the great philosopher, politician and educator of the 6th–5th centuries B.C., are located at Qufu, in Shandong Province. Built to commemorate him in 478 B.C., the temple has been destroyed and reconstructed over the centuries; today it comprises more than 100 buildings. The cemetery contains Confucius’ tomb and the remains of more than 100,000 of his descendants. The small house of the Kong family developed into a gigantic aristocratic residence, of which 152 buildings remain. The Qufu complex of monuments has retained its outstanding artistic and historic character due to the devotion of successive Chinese emperors over more than 2,000 years. Lying to the east of the Temple, the Kong Family Mansion developed from a small family house linked to the temple into an aristocratic mansion in which the male direct descendants of Confucius lived and worked.Following a fire and rebuilding of the temple with an enclosure wall on the model of an imperial palace in the 14th century, the mansion was rebuilt a short distance from the temple. Subsequently expanded, then destroyed again by fire and rebuilt in the late 19th century, it now covers 7 hectares with a total of some 170 buildings. Over 100,000 collections are kept in the Mansion; among them the ten ceremonial utensils of the Shang and Zhou dynasties, the portraits of Confucius made in different periods and clothes and caps dating to the Ming and Qing dynasties are the most famous. Furthermore, the more than 60,000 files and archives of the Ming and Qing dynasties collected in the Mansion not only provide a credible record of all kinds of activities in the Mansion for more than 400 years, but are highly valuable for studying the history of the Ming and Qing period. The buildings were designed and built with meticulous care according to the ideas of Confucianism regarding the hierarchy of disposition of the various components. In the Ming period many outstanding artists and craftsmen applied their skills in the adornment of the temple, and in the Qing period imperial craftsmen were assigned to build the Dacheng Hall and Gate and the Qin Hall, considered to represent the pinnacle of Qing art and architecture. Confucianism has exerted a profound influence not only in China but also on the feudal societies of Korea, Japan and Vietnam and had a positive influence on the Enlightenment of 18th century Europe. The Temple of Confucius, the Cemetery of Confucius, and the Kong Family Mansion are not only outstanding representatives of oriental architectural skills, but they also have a deep historical content and are an important part of the cultural heritage of mankind. The first Buddhist temple in China was built here in Sichuan Province in the 1st century A.D. in the beautiful surroundings of the summit Mount Emei. The addition of other temples turned the site into one of Buddhism’s holiest sites. Over the centuries, the cultural treasures grew in number. The most remarkable is the Giant Buddha of Leshan, carved out of a hillside in the 8th century and looking down on the confluence of three rivers. At 71 m high, it is the largest Buddha in the world. Mount Emei is also notable for its exceptionally diverse vegetation, ranging from subtropical to subalpine pine forests. Some of the trees there are more than 1,000 years old. Mount Emei (Emeishan) is an area of exceptional cultural significance as it is the place where Buddhism first became established on Chinese territory and from where it spread widely through the East. The first Buddhist temple in China was built on the summit of Mount Emei in the 1st century CE. It became the Guangxiang Temple, receiving its present royal name of Huazang in 1614. The addition of more than 30 other temples including the Wannian Temple founded in the 4th century containing the 7.85m high Puxian bronze Buddha of the 10th century, and garden temples including the Qingyin Pavilion complex of pavilions, towers and platforms dating from the early 6th century; the early 17th century Baoguo Temple and the Ligou Garden (Fuhu Temple) turned the mountain into one of Buddhism’s holiest sites. The most remarkable manifestation of this is the 71 meter tall Giant Buddha of Leshan. Carved in the 8th century CE on the hillside of Xijuo Peak overlooking the confluence of three rivers, it is the largest Buddhist sculpture in the world. A contemporary account of the creation of the Giant Buddha is preserved in the form of an inscribed tablet. Associated monuments include the 9th century Lingbao Pagoda and the Dafo (Giant Buddha) Temple dating from the early Qing Dynasty. The Wuyu Temple contains two important statues: the 9th century Dashi bronze Buddha and the 11th century Amithabha statue group, cast in iron and gilded. Over five hundred Han Dynasty tombs of the 1st to 4th centuries, notable for their fine carvings and calligraphic inscriptions are located on Mahao Crag. Lijiang is an exceptional ancient town set in a dramatic landscape which represents the harmonious fusion of different cultural traditions to produce an urban landscape of outstanding quality. In the 13th century AD, during the later Southern Song dynasty, the ancestors of the ruling Mu family moved their main centre from Baisha to the foot of the Shizi Mountains to a new town known as Dayechang (later Dayan), where they began building houses surrounded by a city wall and moat. After Azong Aliang submitted in the 1250s to the authority of the Yuan Emperor Hubilie, Dayechang became an administrative centre. The Lijiang Junmin prefecture was established when the region came under Ming rule in 1382. In 1724 the first non-native prefect began building prefectural offices, barracks and educational facilities at the foot of the Jinhong Mountain. Lijiang County was created as part of Lijiang Junmin Prefecture in 1770. The old town of Lijiang is built on a mountain slope running from north-west to south-east, facing a deep river. The northern part of the city was a commercial district. The main streets in this part of the old town radiate from the broad street known as Sifangjie, which has traditionally been the commercial and trading centre of the north-western part of Yunnan Province. On the west side of the Sifangjie is the imposing three-storeyed Kegongfang (Imperial Examination Archway), which is flanked by the Western and Central rivers. Founded in the 14th century and covering an area of 225 hectares, the Ancient City of Ping Yao is a complete building complex including ancient walls, streets and lanes, shops, dwellings and temples. Its layout reflects perfectly the developments in architectural style and urban planning of the Han cities over more than five centuries. Particularly, from the 19th century to the early 20th century, the Ancient City of Ping Yao was a financial center for the whole of China. The nearly 4,000 existing shops and traditional dwellings in the town which are grand in form and exquisite in ornament bear witness to Ping Yao’s economic prosperity over a century. With more than 2,000 existing painted sculptures made in the Ming and Qing dynasties, Shuanglin Temple has been reputed as an “oriental art gallery of painted sculptures”. Wanfo Shrine, the main shrine of Zhenguo Temple, dating back to the Five Dynasties, is one of China’s earliest and most precious timber structure buildings in existence. The Temple of Heaven, founded in the first half of the 15th century, is a dignified complex of fine cult buildings set in gardens and surrounded by historic pine woods. In its overall layout and that of its individual buildings, it symbolizes the relationship between earth and heaven – the human world and God’s world – which stands at the heart of Chinese cosmogony, and also the special role played by the emperors within that relationship. The property consists of four protected areas: Wuyishan National Nature Reserve (56,527 ha) in the west, Nine-Bend Stream Ecological Protection Area (36,400 ha) in the centre and Wuyishan National Scenic Area (7,000 ha) in the east are contiguous, and the Protection Area for the Remains of Ancient Han Dynasty (48 ha) is a separate area, about 15km to the south-east. Totalling 99,975 ha, the property is surrounded by a buffer zone of 27,888 ha and has been inscribed for cultural as well as scenic and biodiversity values. The Dujiangyan irrigation system, located in the western portion of the Chengdu flatlands at the junction between the Sichuan basin and the Qinghai-Tibet plateau, is an ecological engineering feat originally constructed around 256 BC. Modified and enlarged during the Tang, Song, Yuan and Ming dynasties, it uses natural topographic and hydrological features to solve problems of diverting water for irrigation, draining sediment, flood control, and flow control without the use of dams. Today the system comprises two parts: the Weir Works, located at an altitude of 726m, the highest point of the Chengdu plain 1km from Dujiangyan City, and the irrigated area. Three key components of the Weir Works control the water from the upper valley of the Minjiang River: the Yuzui Bypass Dike, the Feishayan Floodgate, and the Baopingkou Diversion Passage. Together with ancillary embankments and watercourses including the Baizhang Dike, the Erwang Temple Watercourse and the V-Shaped Dike, these structures ensure a regular supply of water to the Chengdu plains. The system has produced comprehensive benefits in flood control, irrigation, water transport and general water consumption. Begun over 2,250 years ago, it now irrigates 668,700 hectares of farmland. Xidi and Hongcun are two outstanding traditional villages, located in Yi County, Huangshan City in south Anhui Province, with commercial activities as their primary source of income, family and clan-based social organization, and well known for their regional culture. The overall layout, landscape, architectural form, decoration, and construction techniques all retain the original features of Anhui villages between the 14th and 20th centuries. Deeply influenced by the traditional culture of pre-modern Anhui Province, these two villages, Xidi and Hongcun, were built by successful officials or merchants returning home from official appointments and business, and gradually developed into models of conventional Chinese village construction. Xidi is surrounded by mountains and built along and between three streams running east-west, which converge at the Huiyuan Bridge to the south. Hongcun is located at the foot of a hill next to a stream which forms two pools, the Moon Pond in the centre of the village and the other to the south. Characterised by rhythmic space variation and tranquil alleyways; and with water originating from a picturesque garden, the whole reflects the pursuit of coexistence, unity and the harmony of man and nature. The unique and exquisite style of Anhui buildings is conveyed in plain and elegant colors, their gables decorated with delicate and elegant carvings, their interiors filled with tasteful furnishings. The rigid patriarchal system together with gentle and sincere folk customs reflects the cultural ideas of scholar-bureaucrats in feudal society who paid special respect to Confucianism and Neo-Confucianism. These surviving villages bear scientific, cultural and aesthetic values with their 600-plus-year history. They are rich sources for the study of regional histories and cultures. The Longmen Grottoes, located on bothsides of the Yi River to the south of the ancient capital of Luoyang, Henan province, comprise more than 2,300 caves and niches carved into the steep limestone cliffs over a 1km long stretch. These contain almost 110,000 Buddhist stone statues, more than 60 stupas and 2,800 inscriptions carved on steles. Luoyang was the capital during the late Northern Wei Dynasty and early Tang Dynasty, and the most intensive period of carving dates from the end of the 5th century to the mid-8th century. The earliest caves to be carved in the late 5th and early 6th centuries in the West Hill cliffs include Guyangdong and the Three Binyang Caves, all containing large Buddha figures. Yaofangdong Cave contains 140 inscription recording treatments for various diseases and illnesses. Work on the sculpture in this cave continued over a 150 year period, illustrating changes in artistic style. The sculptural styles discovered in the Buddhist caves of the Tang Dynasty in the 7th and 8th centuries, particularly the giant sculptures in the Fengxiansi Cave are the most fully representative examples of the Royal Cave Temples’ art, which has been imitated by artists from various regions. The two sculptural art styles, the earlier “Central China Style” and the later “Great Tang Style” had great influence within the country and throughout the world, and have made important contributions to the development of the sculptural arts in other Asian countries. The Buddhist tradition of religious cave art achieved its first major impact at Yungang, where it developed its own distinct character and artistic power. The Yungang cave art represents the successful fusion of Buddhist religious symbolic art from south and central Asia with Chinese cultural traditions, starting in the 5th century AD under imperial auspices. At the same time it vividly illustrates the power and endurance of Buddhist belief in China. Datong, known as Pingcheng in ancient times, became the capital of the Northern Wei dynasty between 398 and 494, and thus the political, economic and cultural centre of their kingdom. It kept its importance until 523, when it was deserted following a revolt. The statues of the Yungang Grottoes were completed in sixty years (460-525); this period marks the peak of development in Buddhist cave art of the Northern Wei dynasty. When the first emperor assumed the throne, Buddhism flourished and in 460 the monk Tan Yao started the carving of the Five Caves; since then, these grottoes have become the centre of Buddhist art in North China. By 525 the initial project, sponsored by the court, was mostly completed, but low ranking officials and monks continued to dig more caves and carve statues. During the Liao dynasty, wooden shelter structures were built in front of the caves, turning the grottoes into temple buildings, such as the Ten Famous Temples. In 1122 these temples were destroyed in a war. Located in the mountainous north-west of Yunnan Province in China, the Three Parallel Rivers of Yunnan Protected Areas is a natural serial property consisting of 15 protected areas, grouped into eight clusters. The Property contains an outstanding diversity of landscapes, such as deep-incised river gorges, luxuriant forests, towering snow-clad mountains, glaciers, and alpine karst, reddish sandstone landforms (Danxia）, lakes and meadows over vast vistas. The 1.7 million hectare site features sections of the upper reaches of three of the great rivers of Asia: the Yangtze (Jinsha), Mekong and Salween which run approximately parallel, north to south, through steep gorges which, in places, are 3,000 m deep and are bordered by glaciated peaks more than 6,000 m high. The property spans a large portion of the Hengduan Mountains, which is the major arc curving into Indochina from the eastern end of the Himalayas. Being located in the convergent regions of the three world’s major biogeographic realms, the property is in an epicentre of Chinese biodiversity. It may also harbour the richest biodiversity among the temperate areas of the world. The World Heritage site represents exceptional testimony to the vanished Koguryo civilization. The Capital Cities of the Koguryo Kingdom are an early example of mountain cities, later to be imitated by neighbouring cultures. The tombs, particularly the important stele and a long inscription in one of the tombs, show the impact of Chinese culture on the Koguryo (who did not develop their own form of writing). The paintings in the tombs, while showing artistic skills and specific style, are also an example of the strong impact from other cultures. The system of capital cities represented by Guonei City and Wandu Mountain City also influenced the construction of later capitals built by the Koguryo regime. The Koguryo tombs provide outstanding examples of the evolution of piled-stone and earthen tomb construction. The site includes archaeological remains of three cities (Wunu Mountain City (only partly excavated), Guonei City and Wandu Mountain City) and 40 tombs, 14 of which are imperial and 26 of nobles. All belong to the Koguryo culture, named after the dynasty that ruled over parts of northern China and the northern half of the Korean Peninsula from 37 BC to AD 668. Macao, a lucrative port of strategic importance in the development of international trade in Chinese territory, became a Portuguese settlement in the mid-16th century and returned to Chinese sovereignty in 1999. The inscribed property presents a group of 22 principal buildings and public spaces that enable a clear understanding of the structure of the old trading port city. With its historic streets, residential, religious and public Portuguese and Chinese buildings, the Historic Centre of Macao provides a unique testimony to the meeting of aesthetic, cultural, religious, architectural and technological influences from East and West. It bears witness to the first and most enduring encounter between China and the West, based on the vibrancy of international trade. As a gateway between China and the western world, Macao played a strategic role in world trade. 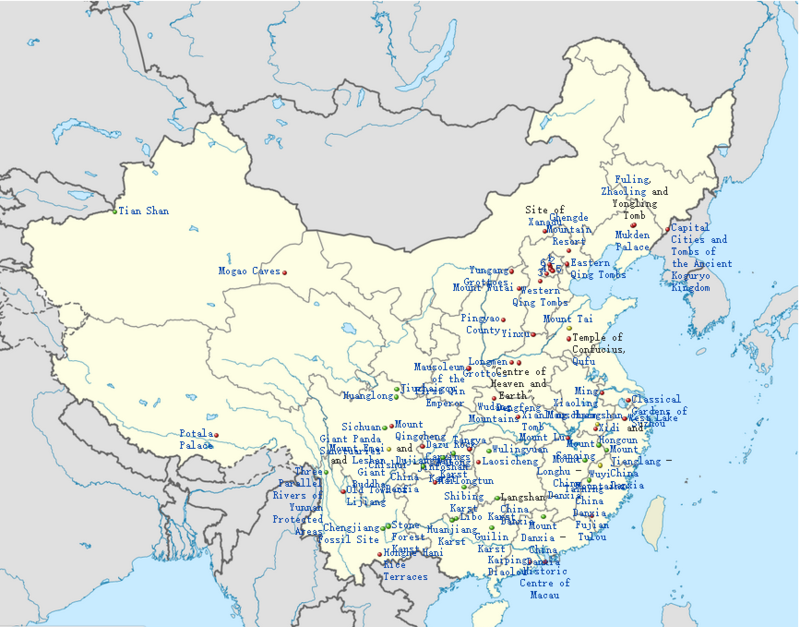 Different nationalities settled in this hub of a complex maritime trading network, along with missionaries who brought with them religious and cultural influences, as illustrated by the introduction of foreign building types (China’s first western-style theatre, university, hospital, churches and fortresses), many still in use. Macao’s unique multicultural identity can be read in the dynamic presence of Western and Chinese architectural heritage standing side by side in the city and the same dynamics often exist in individual building designs, adapting Chinese design features in western style buildings and vice versa, such as the incorporation of Chinese characters as decorative ornaments on the baroque-mannerist church façade of St. Paul’s Ruins. Typical European port city characteristics can also be seen in the urban fabric structure of the settlement with public squares blending into the densely packed lots along narrow, meandering streets, whilst accumulating experiences from other Portuguese settlements, seen in the concept of “Rua Direita” that links the port with old citadel. Visual connections between the property and seascape are attributes that reflect Macao’s origin as a trading port city; the Inner Harbour used over centuries and still functioning today adds to that testimony. Intangible influences of the historic encounter have permeated the lifestyles of the local people, affecting religion, education, medicine, charities, language and cuisine. The core value of the historic centre is not solely its architecture, the urban structure, the people or their customs, but a mixture of all these. The coexistence of cultural sediments of eastern and western origin, along with their living traditions, defines the essence of the historic centre. The archaeological site of Yin Xu, close to Anyang City, some 500 km south of Beijing, is an ancient capital city of the late Shang Dynasty (1300 – 1046 BC). It testifies to the golden age of early Chinese culture, crafts and sciences, a time of great prosperity of the Chinese Bronze Age. A number of royal tombs and palaces, prototypes of later Chinese architecture, have been unearthed on the site, including the Palace and Royal Ancestral Shrines Area, with more than 80 house foundations, and the only tomb of a member of the royal family of the Shang Dynasty to have remained intact, the Tomb of Fu Hao. The large number and superb craftsmanship of the burial accessories found there bear testimony to the advanced level of Shang crafts industry. Inscriptions on oracle bones found in Yin Xu bear invaluable testimony to the development of one of the world’s oldest writing systems, ancient beliefs and social systems. Situated on both banks of the Huanhe River to the northwest of the nationally famous historic and cultural city Anyang, in Henan Province of central China, the archaeological remains of Yin Xu dated from 1,300 BCE and comprise two sites: the Palace and Royal Ancestral Shrines Area and the Royal Tombs Area covering a total 414 hectares with an enclosing buffer zone of 720 hectares. Yin Xu has been confirmed by historic documents, oracle bone inscriptions and archaeological excavations as the first site of a capital in Chinese history. The twentieth king of the Shang Dynasty Pan Geng, moved his capital from Yan to Yin (the area around Xiaotun Village of present Anyang) around 1,300 BC, and established a lasting and stable capital. It spanned 255 years with 12 kings and 8 generations and created the splendid and brilliant Yin-Shang Civilization, which is of priceless value in terms of history, art and science. Yin Xu was the earliest site to possess the elements of civilization, including more than 80 house foundations of rammed earth with remains of timber structures, ancestral shrines and altars enclosed within a defensive ditch which also functioned as a flood-control system. Numerous pits within the Palace area contained inscribed oracle bones considered to carry the earliest evidence of the Chinese written language. The Royal Tombs area on higher ground includes sacrificial pits containing chariots and human remains considered to have been sacrificial victims. Burial goods included decorated bronze ritual vessels, jade and bone carvings and ceramics. Being one of the most important capital sites in early China, its planning and layout had an important influence on the construction and development of subsequent capitals of China. The Royal Tomb Area of Yin Xu is the earliest large-scale royal graveyard in China and the source of China’s system of royal and imperial mausoleums;oracle bone inscriptions are the earliest known mature writing in China and constitute evidence for the history of the Shang Dynasty in China, helping to track recorded Chinese history nearly one thousand years earlier, and the Site of Yin Xu conveys the social life of the late Shang Dynasty, reflecting highly developed science and architectural technology including bronze casting and a calendar system. Sichuan Giant Panda Sanctuaries, home to more than 30% of the world’s pandas which are classed as highly endangered, covers 924,500 ha with seven nature reserves and nine scenic parks in the Qionglai and Jiajin Mountains. The sanctuaries constitute the largest remaining contiguous habitat of the giant panda, a relict from the paleo-tropic forests of the Tertiary Era. It is also the species’ most important site for captive breeding. The sanctuaries are home to other globally endangered animals such as the red panda, the snow leopard and clouded leopard. They are among the botanically richest sites of any region in the world outside the tropical rainforests, with between 5,000 and 6,000 species of flora in over 1,000 genera. Sichuan Giant Panda Sanctuaries – Wolong, Mt Siguniang and Jiajin Mountains is principally renowned for its importance for the conservation of the giant panda, recognized as a “National Treasure” in China and as a flagship for global conservation efforts. The property is the largest and most significant remaining contiguous area of panda habitat in China and thus the world. It is also the most important source of giant panda for establishing the captive breeding population of the species. In addition to the giant panda, the property features a great number of endemic and threatened species of plants and animals, including other iconic mammal species such as the red panda, snow leopard and clouded leopard among the 109 species of mammals recorded (more than 20% of all Chinese mammals). The property is an important centre of endemism for some bird taxa with 365 bird species recorded, 300 of which breed locally. However the property is particularly important for flora, being one of the botanically richest sites of any temperate region in the world with some 5,000 – 6,000 species recorded. Many species are relicts, such as the dove tree, and there is significant diversity in groups such as magnolias, bamboos, rhododendrons, and orchids. The property is a major source and gene pool for hundreds of traditional medicinal plants, many now under threat. Located in China’s southeast province of Sichuan in the Qionglai and Jiajin Mountains between the Chengdu Plateau and the Qinghai-Tibetan Plateau, the property includes seven nature reserves and eleven scenic parks in four prefectures or cities. It covers a total area of 924,500 ha surrounded by a buffer zone of 527,100 ha. The Diaolou and their surrounding villages demonstrate Outstanding Universal Value for their complex and confident fusion between Chinese and western architectural styles, for their final flowering of local tower building traditions, for their completeness and unaltered state resulting from their short life span as fortified dwellings and their comparative abandonment and for harmonious relationship with their agricultural landscape. Mount Sanqingshan National Park displays a unique array of forested, fantastically shaped granite pillars and peaks concentrated in a relatively small area. The looming, intricate rock formations intermixed with delicate forest cover and combined with ever-shifting weather patterns create a landscape of arresting beauty. With its five flat peaks, Mount Wutai is a sacred Buddhist mountain. The cultural landscape is home to forty-one monasteries and includes the East Main Hall of Foguang Temple, the highest surviving timber building of the Tang dynasty, with life-size clay sculptures. It also features the Ming dynasty Shuxiang Temple with a huge complex of 500 statues representing Buddhist stories woven into three-dimensional pictures of mountains and water. Overall, the buildings on the site catalogue the way in which Buddhist architecture developed and influenced palace building in China for over a millennium. Mount Wutai, literally, ‘the five terrace mountain’, is the highest in Northern China and is remarkable for its morphology of precipitous slopes with five open treeless peaks. Temples have been built on this site from the 1st century AD to the early 20th century. Mount Wutai with its five flat peaks is one of the four sacred Buddhist mountains in China. It is seen as the global centre for Buddhist Manjusri worship. Its fifty-three monasteries, include the East Main Hall of Foguang Temple, with life size clay sculptures, the highest ranking timber building to survive from the Tang Dynasty, and the Ming Dynasty Shuxiang Temple with a huge complex of 500 ‘suspension’ statues, representing Buddhist stories woven into three dimensional pictures of mountains and water. The temples are inseparable from their mountain landscape. With its high peaks, snow covered for much of the year, thick forests of vertical pines, firs, poplar and willow trees and lush grassland, the beauty of the landscape has been celebrated by artists since at least the Tang Dynasty – including in the Dunhuang caves. Two millennia of temple building have delivered an assembly of temples that present a catalogue of the way Buddhist architecture developed and influenced palace building over a wide part of China and part of Asia. For a thousand years from the Northern Wei period (471-499) nine Emperors made 18 pilgrimages to pay tribute to the bodhisattvas, commemorated in stele and inscriptions. Started by the Emperors, the tradition of pilgrimage to the five peaks is still very much alive. With the extensive library of books collected by Emperors and scholars, the monasteries of Mount Wutai remain an important repository of Buddhist culture, and attract pilgrims from across a wide part of Asia. For many centuries Dengfeng, one of the early capitals of China whose precise location is unknown, but whose name is now associated with an area to the south of Mount Shaoshi and Mount Taishi, two peaks of Mount Songshan, came to be associated with the concept of the centre of heaven and earth – the only point where astronomical observations were considered to be accurate. The natural attribute of the centre of heaven and earth was seen to be Mount Songshan and worship of Mount Songshan was used by the Emperors as a way of reinforcing their power. The three ideas do therefore converge to some extent: the centre of heaven and earth in astronomical terms is used as a propitious place for a capital of terrestrial power, and Mount Songshan as the natural symbol of the centre of heaven and earth is used as the focus for sacred rituals that reinforce that earthly power. The buildings that clustered around Dengfeng were of the highest architectural standards when built and many were commissioned by Emperors. They thus reinforced the influence of the Dengfeng area. Some of the sites in the nominated area relate closely to the mountain (Zhongyue Temple, Taishi Que and Shaoshi Que); the Observatory is very clearly associated with the astronomical observations made at the centre of heaven and earth, while the remainder of the buildings were built in the area perceived to be the centre of heaven and earth – for the status that this conferred. China Danxia is the name given in China to landscapes developed on continental red terrigenous sedimentary beds influenced by endogenous forces (including uplift) and exogenous forces (including weathering and erosion). It is characterised by spectacular red cliffs and a range of erosional landforms, including dramatic natural pillars, towers, ravines, valleys and waterfalls. The process of its development is characterised by a particular rock sequence, tectonic background, climatic conditions, erosional processes and landforms and these processes have been presented as an interim model. Due to the combined endogenic (tectonic uplift) and exogenic (climatic, erosion, weathering) forces, and other factors, the Danxia landforms have been developed in red sedimentary sequences continuously from the Neogene until the present. The six component parts represent the most important examples of “least eroded” to “most eroded” Danxia landforms, providing a range of different aspects of the phenomenon, and illustrate both the range of landforms in relation to the forces and processes that formed them, together with a range of associated landscapes. The West Lake Cultural Landscape of Hangzhou, comprising the West Lake and the hills surrounding its three sides, has inspired famous poets, scholars and artists since the 9th century. It comprises numerous temples, pagodas, pavilions, gardens and ornamental trees, as well as causeways and artificial islands. These additions have been made to improve the landscape west of the city of Hangzhou to the south of the Yangtze river. The West Lake has influenced garden design in the rest of China as well as Japan and Korea over the centuries and bears an exceptional testimony to the cultural tradition of improving landscapes to create a series of vistas reflecting an idealised fusion between humans and nature. West Lake is surrounded on three sides by ‘cloud-capped hills’ and on the fourth by the city of Hangzhou. Its beauty has been celebrated by writers and artists since the Tang Dynasty (AD 618-907). In order to make it more beautiful, its islands, causeways and the lower slopes of its hills have been ‘improved’ by the addition of numerous temples, pagodas, pavilions, gardens and ornamental trees which merge with farmed landscape. The main artificial elements of the lake, two causeways and three islands, were created from repeated dredgings between the 9th and 12th centuries. Since the Southern Song Dynasty (thirteenth century) ten poetically named scenic places have been identified as embodying idealised, classic landscapes – that manifest the perfect fusion between man and nature. West Lake is an outstanding example of a cultural landscape that display with great clarity the ideals of Chinese landscape aesthetics, as expounded by writers and scholars in Tang and Song Dynasties. The landscape of West Lake had a profound impact on the design of gardens not only in China but further afield, where lakes and causeways imitated the harmony and beauty of West Lake. The key components of West Lake still allow it to inspire people to ‘project feelings onto the landscape’. The visual parameters of this vast landscape garden are clearly defined, rising to the ridges of the surrounding hills as viewed from Hangzhou. The Site of Xanadu is the site of a grassland capital characteristic of cultural fusion, witnessing clashes and mutual assimilation between the nomadic and agrarian civilisations in northern Asia. Located on the southeast edge of the Mongolian plateau, it was the first capital (1263-1273) of Kublai Khan and later the summer capital (1274-1364) of the Yuan Dynasty. The city site and associated tombs are located on the grassland steppe with a north south axis determined by traditional Chinese feng shui principles, backed by mountains to the north and a river to the south. From Xanadu, the mounted warriors of Kublai Khan unified the agrarian civilisations of China, and partly assimilated to the latter’s culture, while extending the Yuan empire right across North Asia. The plan of Xanadu, with Palace and Imperial cities enclosed partly by the Outer City containing evidence of the nomadic encampments and royal hunting enclosure, comprises a unique example of this cultural fusion. Evidence of large water control works instigated to protect the city exists in the form of remains of the Tiefan’gan Canal. As the place where Kublai Khan rose to power, hosted religious debates and entertained foreign travellers whose writings gave inspiration down the centuries, it has achieved legendary status in the rest of the world and is the place from where Tibetan Buddhism expanded. On the south banks of the Hong River in the mountainous terrain of southern Yunnan, the Honghe Hani Rice terraces cascade down the towering slopes of the Ailao mountains. Carved out of dense forest over the past 1,300 years by Hani people who migrated here from further to the north-west, the irrigated terraces support paddy fields overlooking narrow valleys. In some places there are as many as 3,000 terraces between the lower edges of the forest and the valley floor. Responding to the difficulties and opportunities of their environment of high mountains, narrow valleys criss-crossed by ravines, extremely high rainfall (around 1400mm) and sub-tropical valley climate, the Hani people have created out of dense forest an extraordinarily complex system of irrigated rice terraces that flows around the contours of the mountains. The property extends across an area of some 1,000 square kilometres. Three areas of terraces, Bada, Duoyishu and Laohuzui, within three river basins, Malizhai, Dawazhe and Amengkong-Geta, reflect differing underlying geological characteristics. The gradient of the terraces in Bada is gentle, in Douyishu steeper, and in Laohuzui very steep. The landscape reflects an integrated four-fold system of forests, water supply, terraces and houses. The mountain top forests are the lifeblood of the terraces in capturing and sustaining the water needed for the irrigation. There are four types of forests, the ancient ‘water recharge’ forest, sacred forest, consolidation forests, and village forests for the provision of timber for building, food and firewood. The sacred forests still have strong connotations. Above the village are places for the Village God “Angma” (the soul of the village) and for the Land Protection God “Misong”, where villagers pray for peace, health and prosperity. Clefts in the rocks channel the rain, and sandstone beneath the granite mountains traps the water and then later releases it as springs. A complex system of channels has been developed to spread this water around the terraces in and between different valleys. Four trunk canals and 392 branch ditches which in length total 445.83km are maintained communally. Eighty-two relatively small villages with between 50 and 100 households are constructed above the terraces just below the mountain top forests. The traditional vernacular buildings have walls built of rammed earth, of adobe bricks or of earth and stone under a tall, hipped, roof thatched with straw that gives the houses a distinctive ‘mushroom’ shape. At least half the houses in the villages are mainly or partly of traditional materials. Each household farms one or two ‘plots’ of the rice terraces. Red rice is produced on the basis of a complex and integrated farming and breeding system involving buffalos, cattle, ducks, fish and eels. This system is under pinned by long-standing traditional social and religious structures, based on symbiotic relationships between plants and animals that reinforce communal obligations and the sacredness of nature and reflect a duality of approach between the individual and the community, and between people and gods, one reinforcing the other. The Honghe Hani rice terraces are an exceptional reflection of a resilient land management system that optimises social and environmental resources, demonstrates an extraordinary harmony between people and their environment in spiritual, ecological and visual terms, and is based on a spiritual respect for nature and respect for both the individual and the community, through a system of dual interdependence known as the ‘Man-God Unity social system’. This property is a 5,000 km section of the extensive Silk Roads network, stretching from Chang’an/Luoyang, the central capital of China in the Han and Tang dynasties, to the Zhetysu region of Central Asia. It took shape between the 2nd century BC and 1st century AD and remained in use until the 16th century, linking multiple civilizations and facilitating far-reaching exchanges of activities in trade, religious beliefs, scientific knowledge, technological innovation, cultural practices and the arts. The thirty-three components included in the routes network include capital cities and palace complexes of various empires and Khan kingdoms, trading settlements, Buddhist cave temples, ancient paths, posthouses, passes, beacon towers, sections of The Great Wall, fortifications, tombs and religious buildings. The extremes of geography along the routes graphically illustrate the challenges of this long distance trade. Falling to 154 metres below sea level and rising to 7,400 metres above sea level, the routes touch great rivers, alpine lakes, crusty salt flats, vast deserts, snow-capped mountains and ‘fecund’ prairies. The climate varies from extreme drought to semi-humid; while vegetation covers temperate forests, temperate deserts, temperate steppes, alpine steppes and oases. Starting on the Loess plateau at Chang’an, the central capital of China in the Han and Tang Dynasties, the routes of the Tian-shan corridor passed westwards through the Hosi Corridor across the Qin and Qilian Mountains to the Yumen Pass of Dunhuang. From Loulan/Hami, they continued along the northern and southern flanks of the Tian-shan Mountain and then through passes to reach the Ili, Chuy and Talas valleys in the Zhetysu Region of Central Asia, linking two of the great power centres that drove the Silk Roads trade. Thirty-three sites along the corridor include capital cities palace complexes of various empires and Khan Kingdoms, trading settlements, Buddhist cave temples, ancient paths, posthouses, passes, beacon towers, sections of the Great Wall, fortifications, tombs and religious buildings. The formal system of posthouses and beacon towers provided by the Chinese Empire facilitated trade, as did the system of forts, caravanserai and way stations operated by states in the Zhetysu region. In and around Chang’an, a succession of palaces reflect the power centre of the Chinese Empire over 1,200 years; while the cities of the Chuy valley are witness to the power centre of the Zhetysu region from the 9th to the 14th centuries and their organisation of the long distance trade. The series of Buddhist pagodas and large, elaborate cave temples extending from Kucha (now Kuqa County) in the west to Luoyong in the east, record the eastward transmission of Buddhism from India via Karakorum, and demonstrate an evolution in the design of stupas as local ideas were absorbed. Their elaboration reflects the sponsorship of local authorities and the central Chinese imperial government as well as donations of wealthy merchants, and the influence of monks that travelled the routes, many of whose journeys were documented from 2nd century BC onwards. Other religious buildings reflect the co-existence of many religions (as well as many ethnic groups) along the corridor including Zoroastrianism, the main religion of the Sogdians of Zhetysu region, Manichaeism in the Chuy and Talas valleys and in Qocho city and Luoyong, Nestorian Christianity also in Qocho city, around Xinjiang and in Chang’an, and Islam in Burana. The massive scale of the trading activities fostered large, prosperous and thriving towns and cities that also reflect the interface between settled and nomadic communities in a variety of ways: the mutual inter-dependence of nomads and farmers and different peoples such as between Turks and Sogdians in the Zhetysu region; the transformation of nomadic communities to settled communities in the Tian-shan mountains, resulting in highly distinctive construction and planning such as semi-underground buildings; and in the Hosi corridor the planned agricultural expansion of the 1,000 mile corridor after the 1st century BC as an agricultural garrison and its transformation to settled agricultural communities. Diverse and large scale water management systems were essential to facilitate the growth of towns, trading settlements, forts, and caravanserai and the agriculture necessary to support them, such as the extensive Karez underground water channels of the extremely arid Turpan basin, many still in use, that supplied water to Qocho city, and were supplemented by deep wells inside Yar city; the grand scale of the network of open canals and ditches along the Hosi corridor that drew river water to the settlements, 90 km of which survive around Suoyang city; and in the Zhetsyu region, river water distribution through canals and pipes and collection in reservoirs. As well as conduits for goods and people, the routes allowed the exceptional flow of ideas, beliefs and technological innovations such as those related to architecture and town planning that shaped the urban spaces and peoples’ lives in many fundamental ways. Located in the mountainous areas of south-west China, this property encompasses remains of several tribal domains whose chiefs were appointed by the central government as ‘Tusi’, hereditary rulers from the 13th to the early 20thcentury. The Tusi system arose from the ethnic minorities’ dynastic systems of government dating back to the 3rd century BCE. Its purpose was to unify national administration, while allowing ethnic minorities to retain their customs and way of life. The sites of Laosicheng, Tangya and Hailongtun Fortress that make up the site bear exceptional testimony to this form of governance, which derived from the Chinese civilization of the Yuan and Ming periods. Distributed around the mountainous areas of south-west China are the remains of tribal domains whose leaders were appointed by the central government as ‘Tusi’, hereditary rulers of their regions from the 13th to the early 20th century. This system of administrative government was aimed at unifying national administration while simultaneously allowing ethnic minorities to retain their customs and way of life. The three sites of Laosicheng, Tangya and the Hailongtun Fortress combine as a serial property to represent this system of governance. The archaeological sites and standing remains of Laosicheng Tusi Domain and Hailongtun Fortress represent domains of highest ranking Tusi; the Memorial Archway and remains of the Administration Area, boundary walls, drainage ditches and tombs at Tangya Tusi Domain represent the domain of a lower ranked Tusi. Their combinations of local ethnic and central Chinese features exhibit an interchange of values and testify to imperial Chinese administrative methods, while retaining their association with the living cultural traditions of the ethnic minority groups represented by the cultural traditions and practices of the Tujia communities at Laosicheng.